Now that I have more time to relax (because of my broken foot) I thought that I would post some interesting sites that I have come across lately. 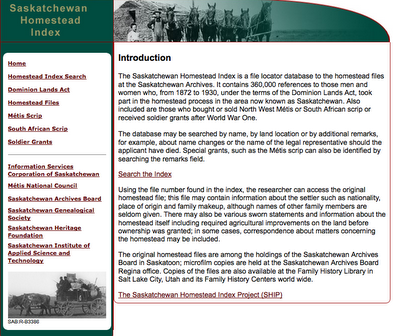 This site SHIP, Saskatchewan Homestead Index Project driving force comes from the Saskatchewan Genealogical Society (SGS). Phase I of the project consists of the extraction and indexing of over 300,000 entries that are easily searched on this website. Phase II of the project involved incorporating this data base in to the index into a larger website that provides valuable information regarding maps, copies of typical homestead paperwork which could include letters and photographs to name a few. Both Phase I and Phase II are currently in place and operational at SHIP. Phase III has yet to be launched, but it is undertaking the monumental task of digitizing all of the records and making them available for research online. No time frame has been set for the release of phase III, but I am grateful for the volunteers that have taken on this task and to assist those of us researching our Canadian Roots. The people that settled in the Saskatchewan area were encouraged to do so by the Dominion Government offering 160 acres for free along with a $10.00 registration fee. The individaul applying for the land had to qualify by being at least 21 years or older, be a British subject or naturalize British subject, had to reside on the homestead for a period of 6 months to 3 years, and make improvements to the property by cultivating at least 30 acres and by constructing a home worth a minimum of $300.00. You may wonder what type of documentation would be included in the homestead applications. The site informs us that each application has the name and signature of the applicant, the birth place and nationality and the location of the homestead and some of the later applications included the ages of family members. Wills, letters, naturalization certificates, and inspector reports can also be found in these documents. Currently this information is only available upon request for a modest fee of $15.00 per homestead location when the name of the homesteader and the legal land description is provided. If the name of the homesteader is known, but the homestead location is uncertain and you can only provide a general area/location, the search will cost $17.00 per homestead location. The cost of both searches include up to six pages of information. If you have Canadian ancestors and would like to check out more, please visit Saskatchewan Homestead Index Project (SHIP).